Last Supper embroidery by Fraefel & Co. The photo is high-resolution, so you can probably zoom in to see the incredible delicacy of the stitchery and execution of the figures. Of course, it immediately begs comparison with Leonardo’s own masterwork. I’m not sure what similarities there are beyond the groupings on either side of Jesus, with Mary Magdalene on his right. Both works show “The Twelve” counting her, and the Judas figure clutches a bag (of silver pieces) in both, though less clearly in the painting. The Disciples are presented as quite different physical types in the two artworks. (Check out their incredible faces in those almost microscopic threads!) You can’t really see eye color in the Da Vinci painting, but in the embroidery, most of the figures’ eyes are incongruously blue, and if not grey, in both works most of them have brown or russet hair. Definitely a Eurocentric view of this crowd of ethnically Semitic types. As well, the energies of the dinner groups are vastly different. Da Vinci’s garrulous, talkative, argumentative apostles surround a resigned, pensive, very human Jesus is seated at a table covered with the remnants of the meal. It is the eloquently human aftermath of the Communion, and just about time to go to the garden of Gethsemane. The painting is a poignant personal moment in the passion of Jesus the man. 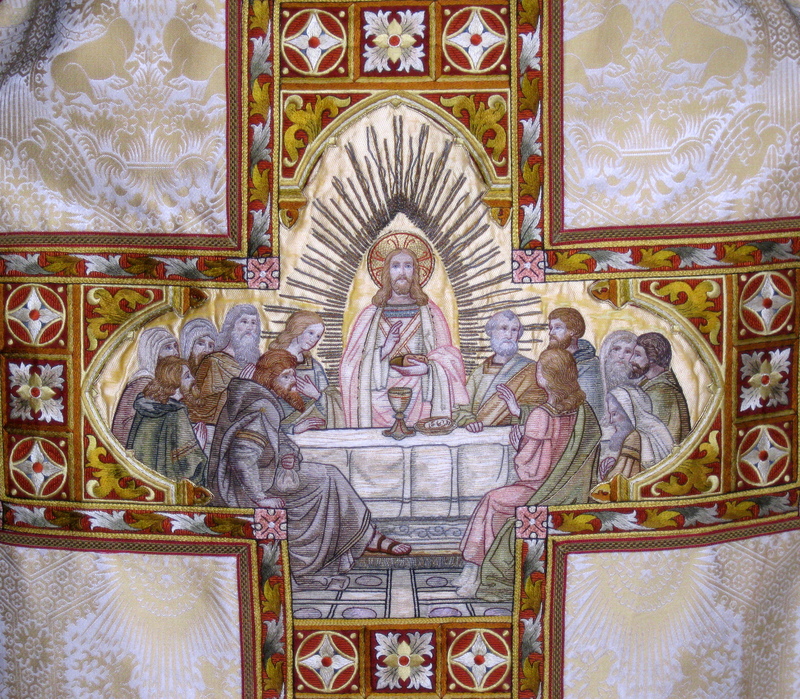 In the embroidery they cluster reverently around the table where a divine Jesus stands (in a glorious aura and halo) to bless their Communion of bread and wine. This is the sacramental moment when Jesus the god says, “Take this and eat—this is my body.” This is why I’d really rather call this artwork the New Covenant. How does all that sound from a life-long fanatical agnostic? Actually, whether you hold by it or not, you’ve got to respect a big honking myth that’s hung on for many thousands of years. The myth of the dying and resurrecting god has been, if you will, resurrected several times in as many parts of the world since mankind began. Often the divine deaths have been much more gruesome than a straight-forward crucifixion. And at least one goddess came back: Inanna/Ishtar/Astarte. In my humble opinion, it’s human nature to try to explain the inexplicable, to embody the ineluctable, to describe the indescribable, to understand the incomprehensible, and to delimit the infinite—by creating myths. Okay then, if you want to split hairs—by creating religions. Often beautiful and inspiring (like the present masterpiece of embroidery), these imaginings or faiths, if you prefer, have provided the fabric of all human civilizations, guidance for people to live with one another (or not), answers for life’s unanswerable questions, a focus for spiritual growth and fulfilment, and a sense of the individual’s place (insignificant though it may be) in the cosmos. You’ve got to give them that. But please, we must also weigh those blessings against the immeasurable oppression, death, and destruction that reputedly enlightened faiths still cause in the name of merciful, loving deities. Is that a fair trade? But then life, like trade, isn’t always fair. In any case, for purposes of encompassing the divinity, I agnostically think that any faith you care to concoct will be no more effective than spitting in the sea. I’ve already written about gratitude being a great attitude. Well, chief among the blessings for which I am immensely grateful is the incongruous fact that this old gay man is a progenitor. I’m now something of a patriarch—please, eldest member—of a direct family line. How that odd situation came about is another story which I’m putting into a memoir, but I now have two lovely daughters, and despite an amicable divorce now 45 years ago, the family is still hanging together, my former wife included. Maybe I’d better say me included, because the extended family is all hers, and all these years I’ve simply been part of it as first husband and father of two of her children. Her son by second (and also temporary) husband I’ve always considered to be my stepson, albeit ex post facto. To my girls I’m Daddy, and to the in- and out-laws, nieces, nephews, etc. (Uncle) Richie. Though we’ve mostly lived in separate cities, I frequently visited the girls where they grew up in Gainesville FL and very much enjoyed watching them do it. 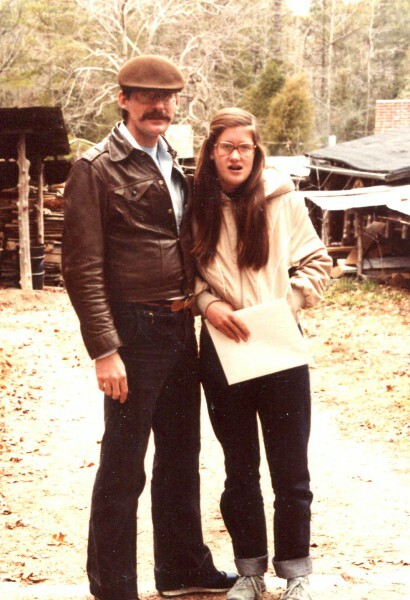 Over the years the whole family sometimes visited me as well, and the teenaged girls and I once did a two-week camping trip across southern Ohio in search of Indian mounds that eventually led to a book. In yet another layer of blessing, my first and only wife and I are now for all intents and purposes the proud grandparents of four grandsons and two granddaughters. My, how we do propagate. Not to mention a new generation of cousins. Generation—we’re now the third generation! If the girls hadn’t waited so long to procreate, we could easily be the fourth right now. Gadzooks! 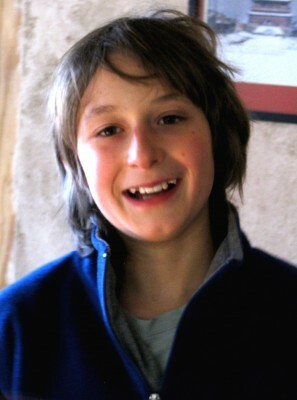 I regret not having photos of the granddaughters or the Atlanta grandsons, but here’s a more or less recent shot of my Santa Fe grandson Jammes, now 12. 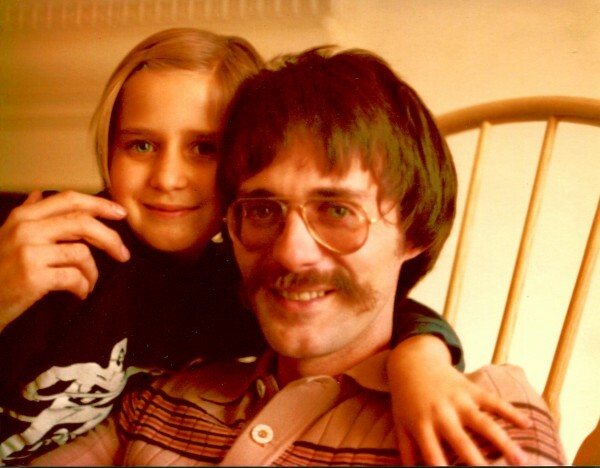 My younger daughter moved out here to Santa Fe around 1990, arriving with her boyfriend, whom I liked from the start. Understandably they’ve been central in my life ever since. Though they didn’t marry till several years later, he always found it amusing to have a gay father-in-law. I always tried to be present and available for them without getting in the way. Also from the start (since we have the same name), my son-in-law started calling me Pappou [pop-poo] having no idea that it was like the Greek for ‘grandfather’ (παππούς). It surprises ethnic Greeks to hear the grandkids call me that. Thus my lurid past in the Gin Mill manifests itself anew in this distant present. Σ ‘αγαπώ, αγάπη μου! My Santa Fe family expanded twelve years ago with the arrival of our youngest grandson, only a few weeks younger than the twins in Atlanta. After he was born, I became basically a daily visitor and have since shared in the vicissitudes of his babyhood, toddler-hood, kid-hood, and now pre-adolescent-hood. It’s been, as we used to say back in the sixties, a trip. It’s regrettable that living so far away, I’ve not been able to share like this in the lives of my other grandsons. On the other hand, maybe that has saved what’s left of my sanity. 1) A seashell. I don’t know the type, but it’s one of those elongated snail types, the kind I’ve seen as pendants on “mound builder” images with a lengthened bottom and belled top. I will boldly admit that I stole it from the pre-Columbian shell-heap called Turtle Mound on Florida’s Atlantic coast. About 40 years ago—so maybe past the statute of limitations? The point being that this modest little seashell is at least 500 years old. 2) A Roman coin. I found it in 1967 in the recently turned dirt in the yard of our new little townhouse in Ann Arbor MI. I’ve since read that such anomalous Roman coins have turned up all over the Americas and in particular at several sites across the Midwest. I’ve never had it studied to find out which Emperor is shown on it, but obviously it must date before the fall of Rome. So maybe 1700 or 1800 years old? 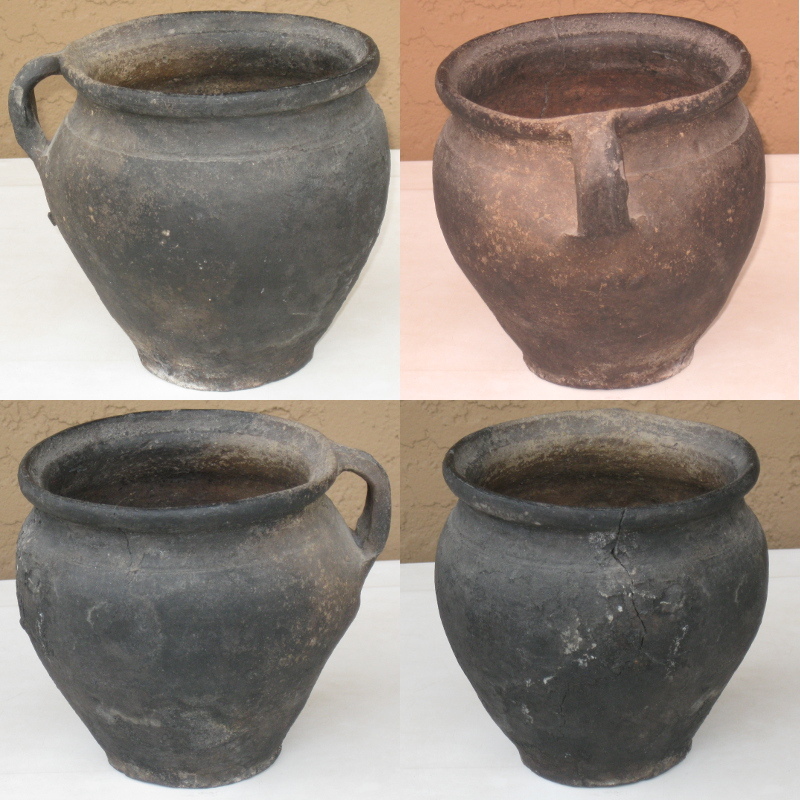 4) A Pre-Roman pot from Dacia. I have that provenance on authority of the guy who gave it to me, also about 40 years ago. And here’s the story. Back then when I had a big Victorian house in DC near Logan Circle, various guys rented rooms, and there were frequent, assorted house guests. One guest for some weeks was a Czech filmmaker from Prague named Jaroslav (who reminded me of Gerard Depardieu). When he was nabbed for selling dope on 14th Street, it came out that Jaroslav had smuggled in several items supposedly stolen from museums back home in Czechoslovakia. He’d managed to sell off all but one, the pre-Roman pot from Dacia, and by default that became my hostess gift. Make that maybe 2500 years old. The pot is about seven or eight inches tall, in remarkably good shape, exactly like I got it 40 years ago, with a noticeable but not dangerous crack down from the lip on one side. I think these details are quite visible in the photos below. What I would like to find is a collector or museum, (maybe even the original museum?) to take this little treasure and give it the visibility, respect, and preservation that it deserves. For goodness sake, contact me. After those last two effusions about Latin and Greek music, I was planning to write about one of my true loves, classical music. All in good time. Instead, I feel like writing something about another, my love for the subject of pre-Columbian Native America. 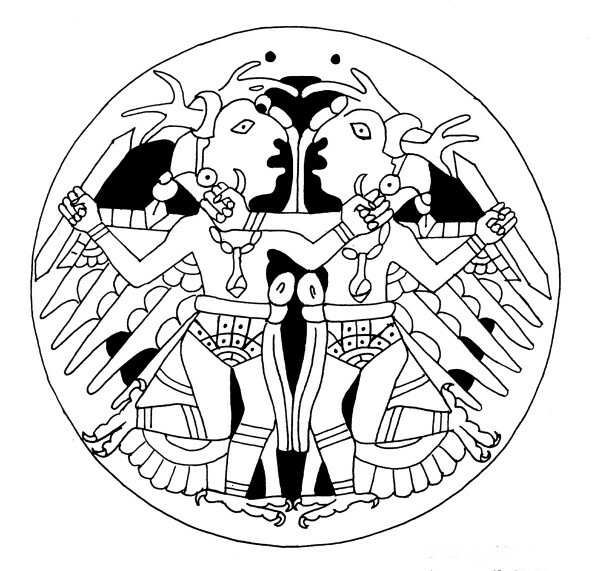 There’s a piece of Mississippian shell art, a gorget from Hamilton County, Tennessee (AD 1200-1400), that I personally consider the most evocative image I’ve ever found from that lost world. I gather that the gorget now resides at the McClung Museum at the University of Tennessee, but I made bold to do a line drawing of it for my old book, which I’ve included in my Gallery of Artifacts. 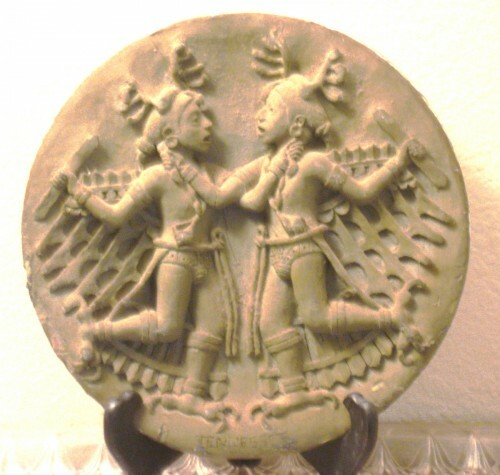 It presents a pair of “falcon” warriors. So what if it’s rendered in a rather “primitive,” or better, unsophisticated, manner. The original artist was working with the tools and materials available and did a remarkable job. It’s the concept behind the image that fascinates me. So much so that almost thirty years ago, I re-visioned these warriors as a bas relief in modeling clay in a, shall we say, more modern or sophisticated manner. The model has lurked around (actually quite prominently) on my bookshelves, desks, etc. ever since, suffering a tiny bit of damage to the antlers and the seashell pendants, and growing an intriguing darkened glaze on its still soft surfaces. That just makes it more existentially real. Still in love with the underlying concept, I recently played around with the above photo on my freeware program (GNU Image Manipulation Program) to try and bring out the image better. Apologies that I love purple and amethysts. I rather like the depth of the figures and wings, don’t you? It’s great to contemplate the details, like the pattern on the feathers, reminiscent of the barred pattern of the peregrine falcon. 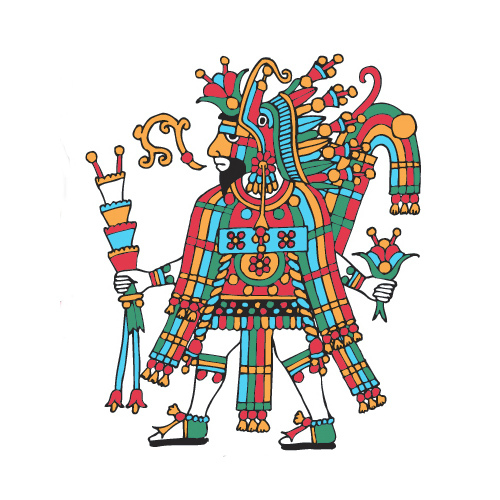 The claw-feet are quite like those frequently found in early Mexican iconography, and their flint “swords” have apparently been unearthed at many archaeological sites. The bun hairstyle and beaded forelock would seem to be standard fashion as they’re found in images from all over the Southeast and even on shell art from the Spiro site in Oklahoma. The deer-antler headdress is also rather frequent and may just possibly relate to the Celtic horned god of nature and fertility, Cernunnos. Most intriguing is the fact that these warriors have each seized hold of a lock of the other’s hair. It’s tempting to think of this as perhaps a form of “counting coup” on each other in a battle, but I’m inclined to think it’s more of an affectionate connection, maybe between twin brothers who comprise the falcon. You could run on about duality and all that, I guess, but whatever. 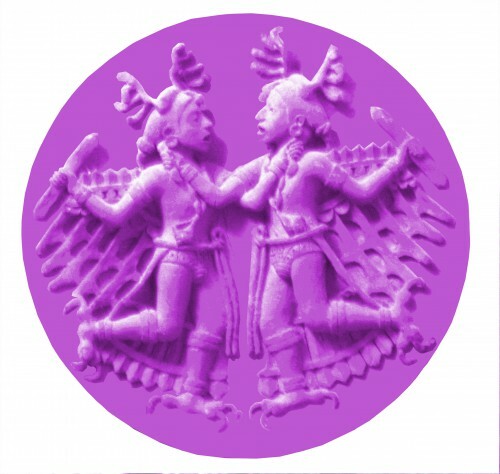 And in that case, I really have to wonder if this warrior pair might possibly be a faint, distant echo of the Maya Hero twins Hunahpu and Xbalanque. Just saying.